On the whole Dad’s Army showed us very little of the platoon members’ home lives. This is especially true of Mainwaring, whose absent wife, Elizbeth, became something of a standing joke. We saw a little of the life of the Pike’s (strangely always with Wilson in attendance) but the family members who featured most prominently were Dolly and Cissy, Private Godfrey’s spinster (we assume) sisters. We last saw them in their garden in the episode Is there honey still for tea? For today’s moment I’m zooming back to the second series and to an episode that, for many years, appeared to be lost altogether. A lot has been written about the Dad’s Army lost episodes and the rediscovery of two of them in 2001. 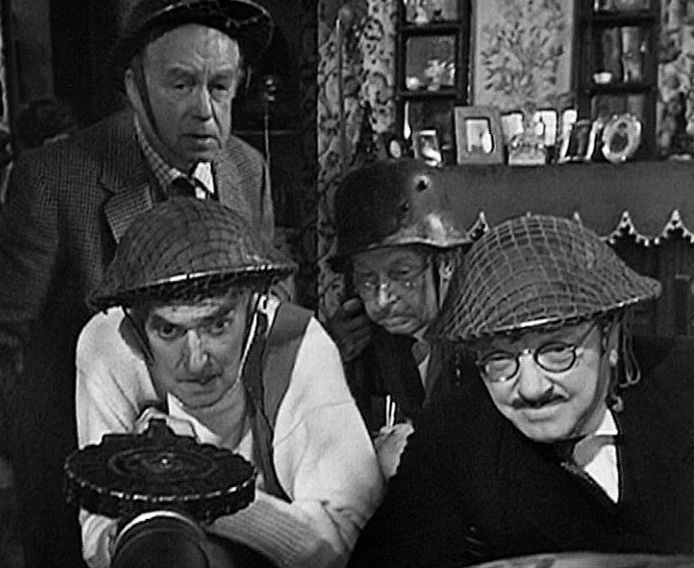 One of them, The Battle of Godfrey’s Cottage was a real highlight of the second series and a sign of the heights that Dad’s Army would achieve in series 3 and 4. A false invasion alarm sends the platoon scuttling to their posts but Mainwaring misses the alarm and ends up with Frazer and Jones setting-up a makeshift machine gun post at Godfrey’s cottage, much to the surprise of all three Godfreys. There is wonderful confusion as the sisters are convinced that it is a social visit (and that Frazer is a cushion salesman) and Mainwaring struggles to set up his machine gun without scratching Godfrey’s antique furniture. This entry was posted in blog on July 10, 2018 by wolAdmin.